Meet Greasedaddy. We carefully constructed his profile to appeal to a very specific person, mainly an exceptionally strange one. He is a white bisexual male from Iowa who frequently sports a neckbeard, very tall at 6'5", has comments like "I am an open book with a few pages stuck together", and claims to be "well-known throughout the streets". I included a mugshot background for the profile pic for added effect. 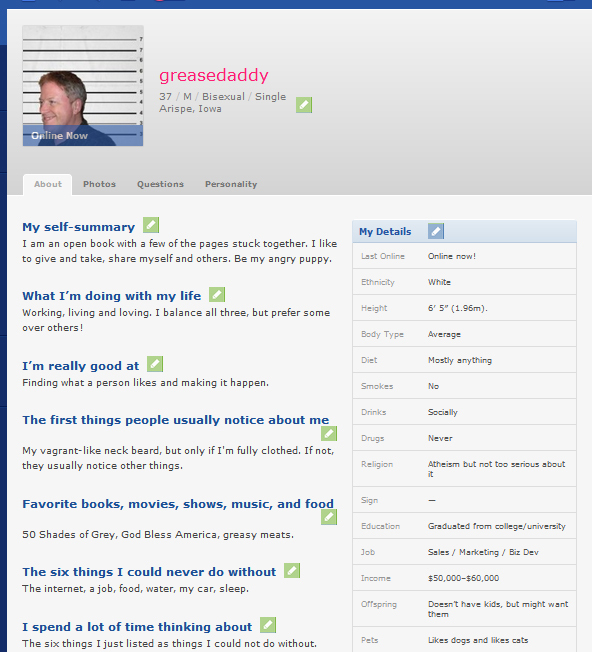 If Greasedaddy can find love, then you can too. Check back for actual corrospondence (with identities protected, of course) as it rolls in. We hope to find that one-in-a-million person that will look past all of the red flags to find the non-existent person within. Hopefully a little desperation will go a long way here.